The annual Minneapolis rap festival Soundset, which was created by revered underground label Rhymesayers, takes place on May 27 at the Minnesota State Fairgrounds this year. Like every year, the 2018 edition includes Rhymesayers act Atmosphere, and this year’s big-name headliners are Migos and Logic. 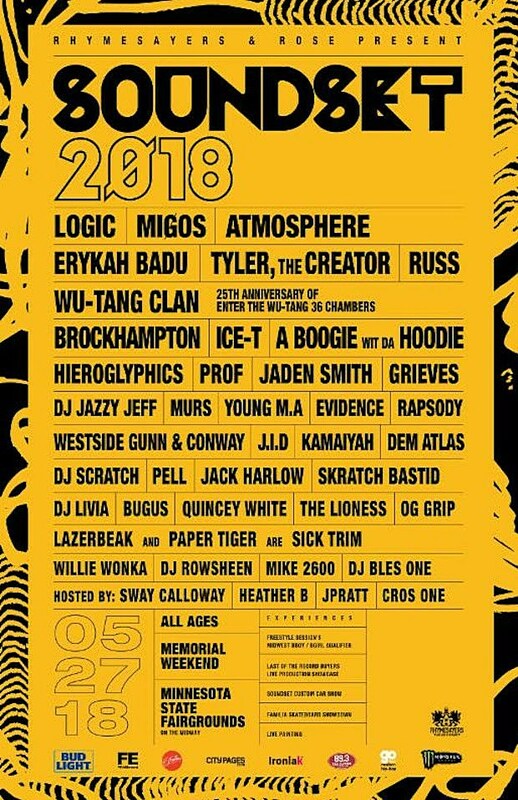 The lineup also includes Wu-Tang Clan (celebrating the 25th anniversary of Enter The Wu-Tang: 36 Chambers), Erykah Badu, Tyler, The Creator, Brockhampton, Hieroglyphics (who count Del the Funky Homosapien as a member), Jaden Smith, Ice-T, Pell, A Boogie Wit Da Hoodie, DJ Jazzy Jeff, Young M.A, Rapsody, Kamaiyah, Westside Gunn & Conway, and much more. Tickets can be found HERE. View the full lineup below. Also appearing at the upcoming festival is Rhymesayers artist (and Dilated Peoples member) Evidence, who recently put out his latest LP Weather or Not. The new record includes appearances from fellow Dilated Peoples members Rakaa and DJ Babu, Atmosphere’s Slug, and Rapsody, among others. You can stream the record in full below.